This Gem is already with me for couple of weeks- I just could not find few free minutes, with good light, to take pictures of it. After all, it is not going anywhere. So finally here it is- unglazed shiboridashi with cup. It is very simple, just like a stone. It was fired in part of the kiln where, when temperature reaches its top, we throw in charcoal. It is technique full of surprices, but it usually creates earthy, matt or/and rusty colors and surfaces. On this fine, pale stoneware we sometimes find this kind of lovely, multicolored and pleasant to touch surface which you can see on this fourth Gem. For descriptions and more pictures please click here. If this "Ten Gems of Ten Kilns" project is new to you, please read this post first. Clay has very unusual hue of brown color, with hint of purple. It is without sand or another larger, rough particles in it. On first touch you can feel its plasticity. 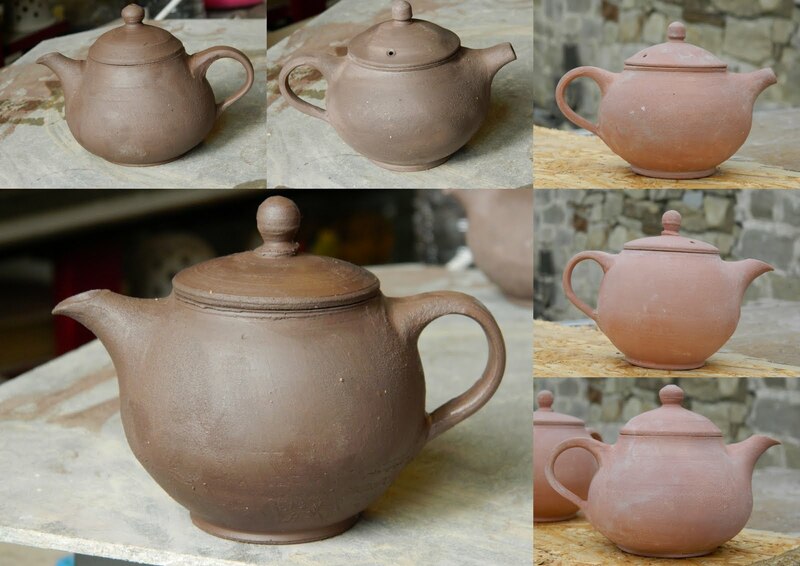 I got around 1,3kg of clay and I was decided to try to create some teapots from it. But first, I had to make some tests and see how it will work in or kiln. I made several small cones and laid out them around kiln chamber. I put some of them to hot places, some to colder and some even to chimney. For 100ml teapot I usually need around 120g of clay. Plus I need some clay for lids and spouts. It means that if everything will go well I can make seven teapots. For the first shot I decided to go for trio. I have to say, this kind of clay is pleasure to work with. It is very smooth, plastic and strong. I haven´t expected such malleable material; it is great, at least for small forms. Here you can see several pictures from the process. We usually do our first, bisque firing, in electric kiln and mostly to around 1000°C. From my experience, it is crucial for such high iron, low fire clays to be bisque fired in oxidation or neutral atmosphere. If such pot, made from iron rich, low-fire clay, is fired in stronger reduction without first firing it in oxidation you will find it bubbled or collapsed much sooner. That is why I have "bisqued" those three teapots even though I was not going to glaze them. As you see I let those teapots in bare-clay rendition. All three can hold around 120ml and walls are pretty thin. There are some points on each of them, which I see now as imperfections. But I was going for natural and my-own look and feeling. From this point of view I am more then happy. Attentive readers of my blog already know that one of them has become part of my Gem Collection. Second one stay with me, as part of my young sheng tea sessions. And the third one went as a gift to Peter Stanik's hands as my thanks for the opportunity to try this wonderful clay. At the end, you can take a look at Lui Ming Zhu's work from this clay here.